On the morning of August 27, 2014, as passengers aboard Carnival’s Magic cruise ship waited eagerly to go ashore on Grand Cayman island, they were oblivious to the damage that the ship had just caused while anchoring. The anchor missed its intended sand patch target and destroyed more than 11,500 square feet of coral reef in front of Don Foster’s dive shop, making it one of the worst environmental accidents in Cayman history and a major blow to the island’s fragile environment. Divers from Don Foster’s went out immediately and took video of the chain laying on the reef. The sight was shocking. What had once been a pristine reef now looked more like a gravel quarry. Huge stands of corals were overturned and tons of rock and sediment choked live corals. Equally dismaying was the sight of numerous fish hovering around in a vain attempt to find their former homes, including damselfish, already known for their aggressiveness, that nipped angrily at divers. As more volunteers rushed to help, within weeks an estimated 32,000 pounds of rubble had been removed and a number of coral heads righted. A number of local dive shops regularly shuttled volunteers to the site. 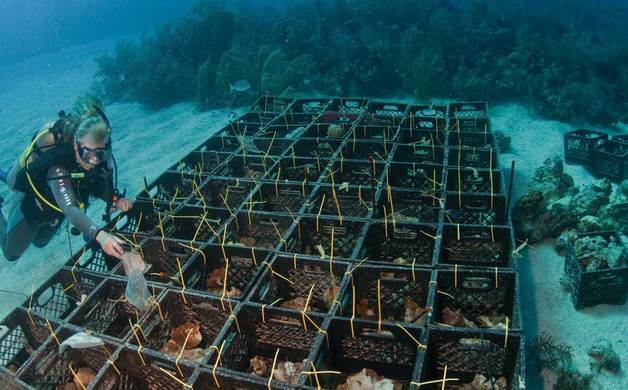 The plan was to later cement back broken live coral using a special marine epoxy, and even create a “coral nursery” where new corals could be grown to be “planted” in the damaged area. 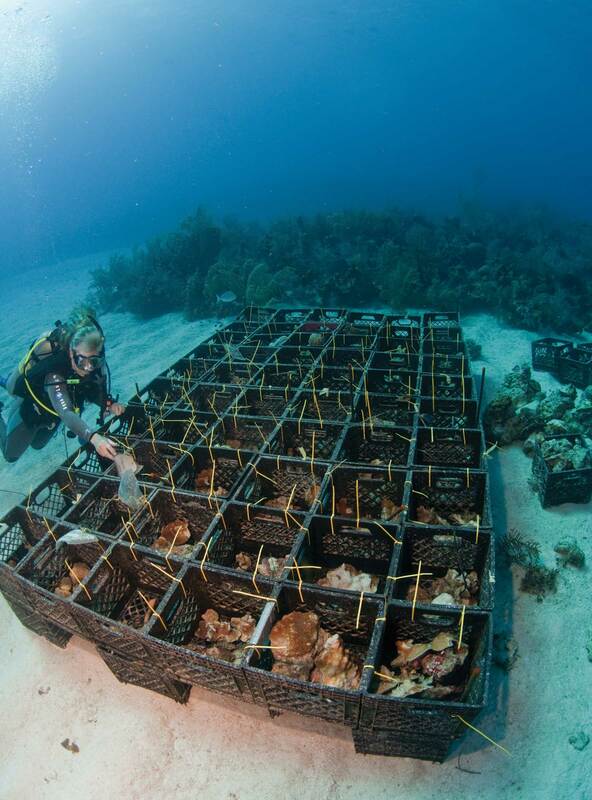 “Rubble removal and stabilization are crucial to the restoration and recovery of the reef,” explains Hatcher who learned how corals grow and how to reattach them, as an intern at the Florida Keys-based Coral Restoration Foundation (CRF). “Studies have shown that coral survival in the rubble field is on average between zero to 18 percent compared to survival rates of 49 to 56 percent in restored areas,” explains Hatcher, who says that although CRF has not been directly involved in the project, they have been there for moral support and to answer questions as needed. Hatcher also has on-site experience as she was earlier involved in coral restoration when a Maasdam cruise ship dropped its anchor on Soto’s Reef in George Town in 1996, damaging 7,500 square feet of reef which necessitated about 9,000 hours of underwater repair work. She estimates that the current project will take about 1 1/2 years. The DoE financed initial work but the scope of the project quickly strained available funds. As a result, local dive shops banded together to seek additional funding, through social networking sites and a special fundraising night. “I’m happy to say that the donations are starting to really roll,” says Hatcher. “We are absolutely amazed at the generosity of some people!” Recently Carnival Cruise Lines donated $100,000 to the effort. The Cayman economy depends heavily on diving, and The Cayman Marine Conservation Law prohibits damaging coral anywhere in Cayman waters. But as it can take a coral reef at least 60 years to reestablish itself, if at all, the disaster hits close to home. The DoE estimates damage at anywhere from $1.5 million to as high as $14 million dollars if based on data from the Florida Keys National Marine Sanctuary. Glenn Ostle is a Charlotte, North Carolina-based freelance photojournalist. His articles and photos have appeared in a number of travel and dive magazines and can be viewed at featherandfins.com. The plan was to later cement back broken live coral using a special marine epoxy, and even create a “coral nursery” where new corals could be grown to be “planted” in the damaged area. Funds and volunteers are always needed. More information can be found on the Cayman Magic Reef Recovery Facebook page, and there is a way to donate through the Cayman National Trust (nationaltrust.org.ky/index.php/donate). 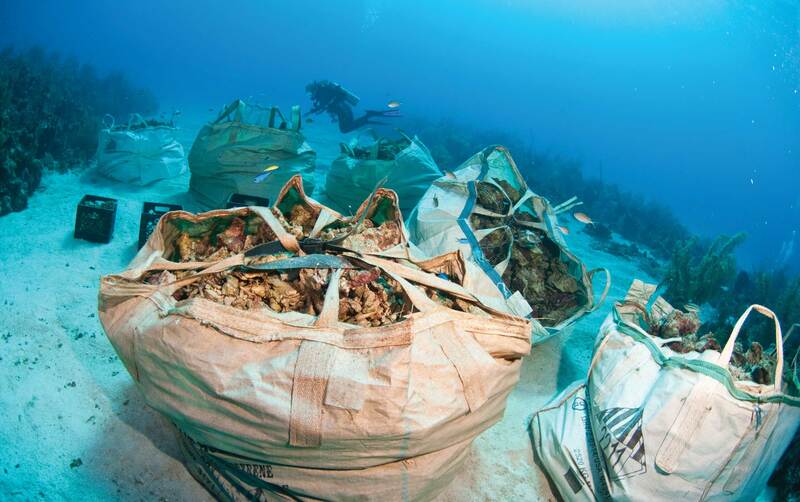 To learn more about coral restoration and even how to become certified to help repair damaged reefs, contact the Coral Restoration Foundation in Key Largo (coralrestoration.org).